RodPrjónar: Playing with Silk: Rock Island. Playing with Silk: Rock Island. Last December Hiro sent me a package full of delicious things... among those things there was a skein of 100% lace silk from Greta and the fibers (along with another skein of undyed alpaca). The yarn is BEAUTIFUL and it is hand dyed! The color she sent me was a very bright red/pink almost fucsia (uff, it is so difficult to describe colors!!). 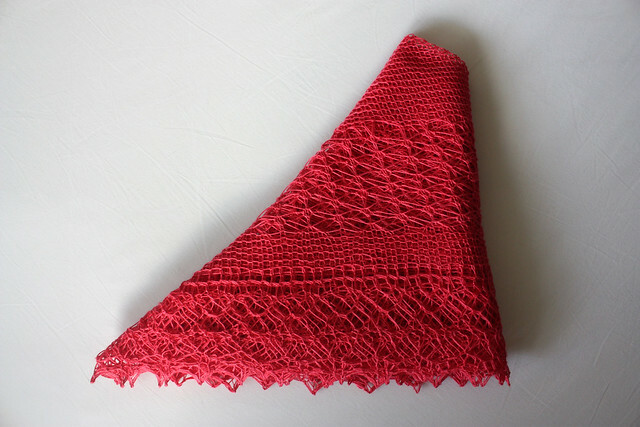 I had been so busy that I hadn't had the chance to put my hands on it and start a project until a few weeks ago when I decided that it was time to try to knit a shawl with silk. Detail of all the sections. * This shawl was a challenge to my patience in many ways: trying a new yarn, some boring sections, some mistakes, some unravelling, etc. * This was my first time knitting with 100% pure silk. It was a whole new experience. I must admit that it was a bit frustrating at first. The yarn is so slippery that it was very difficult to catch the stitches to knit them, especially if I had to make a K2Tog. I had to start the whole thing 5 times until I got the hang of it! So, there was a lot unravelling at the beginning. The join where the stitches are picked up to begin the body of the shawl looks pretty neat. * The pattern, oh the pattern: I have mixed feeling about it. It was very interesting to knit from the border and not from top down as all the triangles I have knitted and also for the fact that there is NO PURLING!! BUT it was terribly boring to knit that long, almost endless 71 repeats band of 12 stitches wide. I was really going nuts! * I got a huge relieve when I finally picked up the stitches and began with the lace section (the Rock Island pattern). In general, I would say that the pattern is pretty simple and easy to memorize even though it is patterned on both sides. The lace section was knitted pretty quickly. * Then, another tedious part! The garter stitch section was ENDLESS!! Very simple but extremely boring! * Blocking was rather easy and YES! Silk blocks WONDERFULLY! It holds the shape so well! It is very light but at the same time it has a beautiful drape. The shape is so nice and it drapes wonderfully. * After I removed the pins I thought that the patience and perseverance did pay off: The shawl is really pretty but I think I should have made maybe 2 more repeats of the lace section so the garter stitch triangle would have been smaller. * I am not sure I would knit this again... but if I do I will add those repeats I mentioned above to make it more "lacy". For now I will keep it for myself... too bad I can't wear it! hehe. OOOHHHHH me encanta!! tengo debilidad por todo lo que tu haces, los chales se te dan genial y el color de este es muy especial. A pesar de lo que digas, la parte en "garter" no lo hace aburrido, compensa muy bien los patrones del "lace" que son especialmente marcados, es un diseño fantástico. ¡Hola Rodrigo! Hace poco que he descubierto tu blog y teng oque decirte que me encanta todo lo que tejes. Por eso te he dejado un premio en mi blog. Me encantaría poder participar en en sorteo que estas organizado por tu cumpleaños bloguero pero no hay manera de que te pueda dejar un comentario. Rodrigo, es precioso... pero es que conozco las lanas Greta y son todas preciosas... Marga es una artista! La verdad es que estoy obsesionado con las sedas de Marga!! jeje No puedo esperar para poner mis manos sobre otros ovillos de sus lanas! La verdad es que te ha quedado muy bonito. También hay que decir que todavía no he visto un chal tejido por ti que no me haya gustado. Estoy contenta de que hayas disfrutado tejiéndola, de eso se trata no? de poder pasar unos buenos ratos haciendo lo que más nos gusta que es tejer. Muchas gracias Marga! Como le decía a Belén, estoy medio obsesionado con tus sedas! Ya quiero tejer más con ellas! La disfruté muchísimo... y más aún al ver lo lindo que queda una vez bloqueado. Una maravilla! Sí! Anímate a terminarlo! No te arrepentirás! Puede ser un poco tedioso a ratos pero cuando lo bloquees lo ADORARÁS!! Todavía tengo que probar el ovillo de alpaca de Marga que tengo en casa... seguro que es una pasada también! 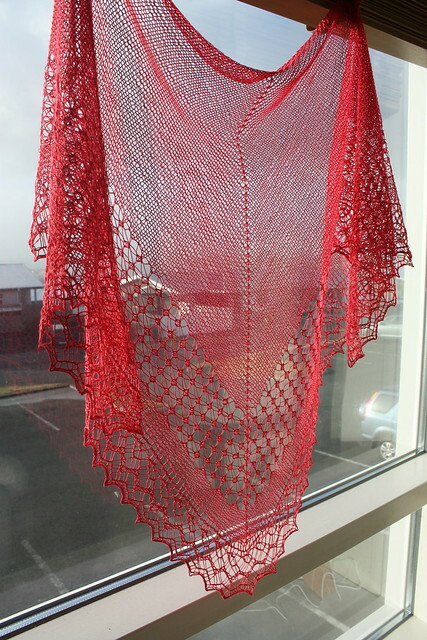 I think I would describe the color as more vermilion, but either way the shawl is lovely. The garter stitch is good for doing while you're watching TV or if you're trying to be very Zen. I'm working on the body of a lopapeysu at the moment, so it mostly comes out in the evenings during our TV time. Yes, I think you're right. It could be vermelion. I am really bad at naming colors! Garter stitch kills me... I find it so boring! Everytime I knit a lopapeysa I want to get to the yoke as soon as possible to have some action going on! It's gorgeous! The color is sooo pretty and the pattern is awesome! It looks like it was worth all the trouble. I can just imagine how soft it must be since it's silk. I love the name of that yarn, "Greta and the Fibers". What a fun name! It was ABSOLUTELY worth all the accidents and mistakes. I am very happy with it. The silk is AMAZING! As I said a bit tricky at first but the result is so elegant and beautiful! "uff?" 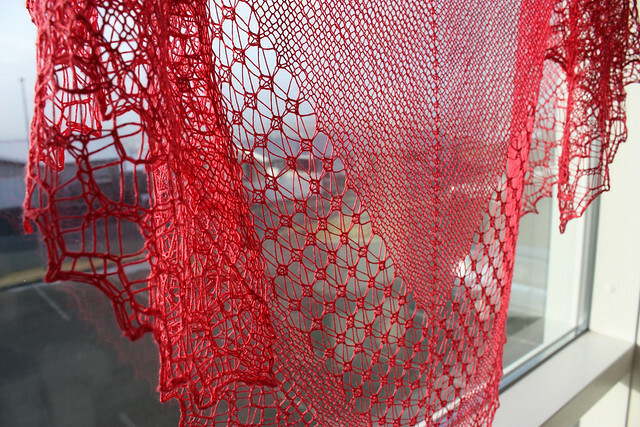 :-)The first two pictures of the finished shawl are beautiful! Then I got into your dialogue of making it. I'm sorry, but I did have a few chuckles.First of all, if I had to restart somthing 5 times - never happen! Maybe twice and stretching it maybe three times, so obviously you have more patience than I do. I've never knit with 100% silk and now I don't think I will. If you had trouble with it, I hate to think what I would do! When you said parts were boring I figured I would be saying "Ahhh..." and loving every minute of it. Mindless knitting can be very relaxing. I can't imagine anything you knit being "ugly" or "hideous." In spite of all the agony, it turned out to be breath taking and the picture of it in the window is wonderful! :-) I'm not very smitten with Jared Flood's patterns. He seems to think he always has to do everything differently than anyone else, and all that is frustate me. I think you need to do at least two or three more Hyrna Herborgar shawls before you try this one again. I bet your friends were glad when you finished it. :-) It is beautiful and I'm sure you'll find the perfect person to give it to. I have this problem with what you call mindless knitting... i get extremely bored! Then I knit a few rows and then try to find something more fun to do... like checking ravelry, hehe. So, in the end the easy parts go always very slow! This is the second pattern of Flood that I use. The first one was a hat (that I didn't even take a picture of before giving it to my friend!)... No, no, this is the third, then I tried to make a circular shawl called Girasole and I found it extremely boring so I left it. And now this, which was interesting. Ánimo! Ya quiero ver el tuyo terminado!! Te quedó PRECIOSO!! !, el color divino y realmente admiro tu paciencia jeje. Muchas gracias por pasar! Me alegra que te guste :) Valió la pena el esfuerzo! jeej. Ayer estuve mirando las fotos del tuyo y es increíble lo diferente que se ven! Me gustaría probar, si algún día me da el ánimo, hacer otro con una lana más gordita que queda muy bien! 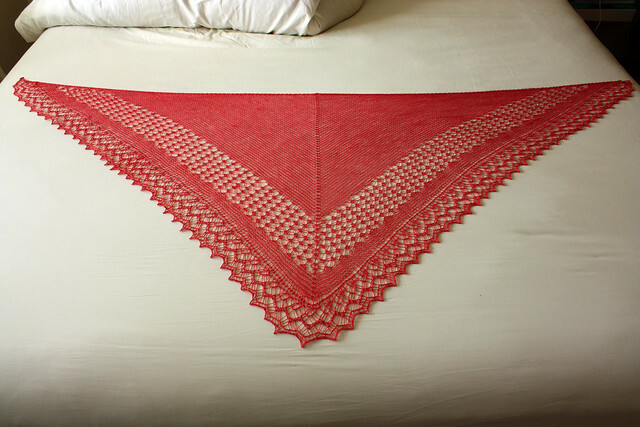 What a gorgeous shawl and the color is amazing! Good to know about silk yarn, I've never used 100 % silk, only blends and it would be interesting to try. 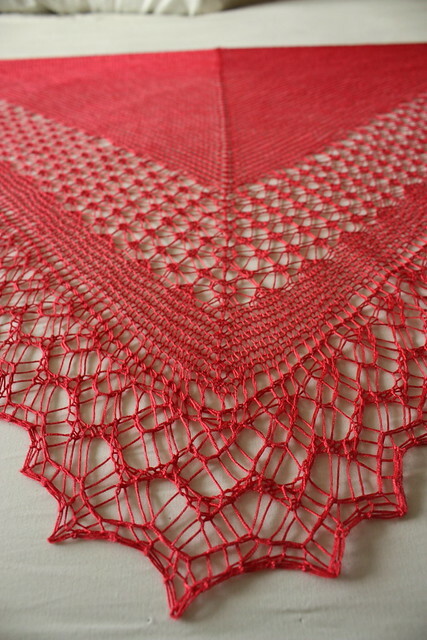 Until now I had also used only blends, which are really nice to knit... but 100% silk has really stolen my heart! You should definitely try it! Being patient does really pay off!! I'm still fighting with mine but will get it done sometime soon! I am looking forward to seeing yours!!! Yo estoy tejiendo este mismo chal ahora mismo, y no puedo estar más de acuerdo con todo lo que dices! También tuve que empezar unas cuantas veces antes de atacar las 71 repeticiones de golpe. Yo lo estoy tejiendo con Jade Sapphire Lacey Lamb, creo que es la lana más fina que he usado en mi vida! La construcción es realmente interesante, pero me gustó más Bridgewater. Yo aún no lo he bloqueado y me está preocupando un poco, porque no tengo blocking wires... a ver qué sale. (Sólo me faltan unas cuantas vueltas y ya está! Que ganas! Es un regalo retrasado de cumpleaños para una amiga que hizo 40). Qué alivio leer que alguien está teniendo los mismos problemas que yo! Hasta ahora nunca me había pasado con ningún chal tener que empezar TANTAS veces! Hubo oportunidades en que empezaba a tejer y al final terminaba en balance negativo! Tejía una fila pero desarmaba dos! jeje. No conozco el Bridgewater... lo voy a buscar! Sobre los alambres para bloquear... yo te recomendaría tratar de comprarlo, así te aseguras que el borde recto (la hipotenusa del chal, por así decirlo) quede bien pareja y bonita. Luego para las puntas basta con sólo usar alfileres. Voy a seguir to blog para ver cómo te queda!! En el blog aún no he puesto nada del chal, lo estoy tejiendo mientras buscaba un ovillo para una manta de bebé que se me quedó a medias. En ravelry tengo proyecto empezado pero aún ninguna foto (soy betty en ravelry). Ya te avisaré cuando esté! (Hoy he conseguido terminar la mantita despues de muchas aventuras buscando el ovillo!). 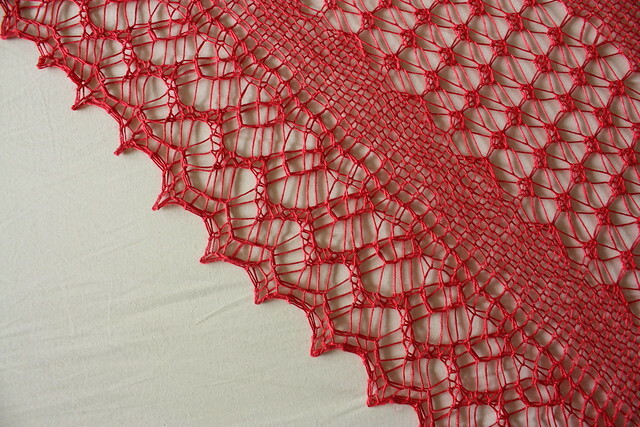 Rod- I loved reading about your thoughts and frustrations as you created this beautiful shawl. For some reason- I just imagined that a talented knitter like you would just whiz through anything- lol! I'm happt to see that even someone with your extensive talents can be a little frustrated at times. The color is absolutely magnificent. When it is given - it is going to be an unbelievable gift! It is truly more beautiful than words. I've been working with silk yarn right now as well- and it really is slick- although I will admit that the little baby dress is exquisite! When you have time-- will you email me privately. My husband and I are coming to Iceland next summer-- I'd love a little chat--- I can't find your email address anywhere. Oh well... there is always some effort behind every knitting project... but this one was unbelievably big!! It doesn't happen to me so often that I get so frustrated that I don't finish a project. I like to finish everything I start! Don't you find that silk is awesome?! Now I don't want to knit with anything else but silk!! Increible!!! precioso...y el color ideal. The truth is that crochet is something that I have kept an eye on for the longest time but I have never dared to try anything but a few amigurumis. I don't know why! I am going to follow your blogs! Both of them even though I don't understand polish (well, except for the words that we have in common!). Ah! Og takk fyrir síðast!! il est magnifique ce châle quelle travail!!!!! qué te voy a decir???!!! es maravilloso Ro! y pensando en lo que has escrito..¿cómo quedaría con todo el chal en el patrón calado?? eh?...no sé si lo probaré...pero estoy de acuerdo en que al menos unas repeticiones más no le vendrían nada mal!! I had been thinking of tackling this as my first lace project, so the detailed photos and review are a huge help. Thanks! Pues me ancantaría pasar a ser dueña de alguno de tus obsequios, lástima que en caso de ser así tendría que estat guardado un tiempo hasta que todas mis cosas salieran de sus cajas. Lass mudanzas en sí no son bonitas, pero la aventura es para recomendar.